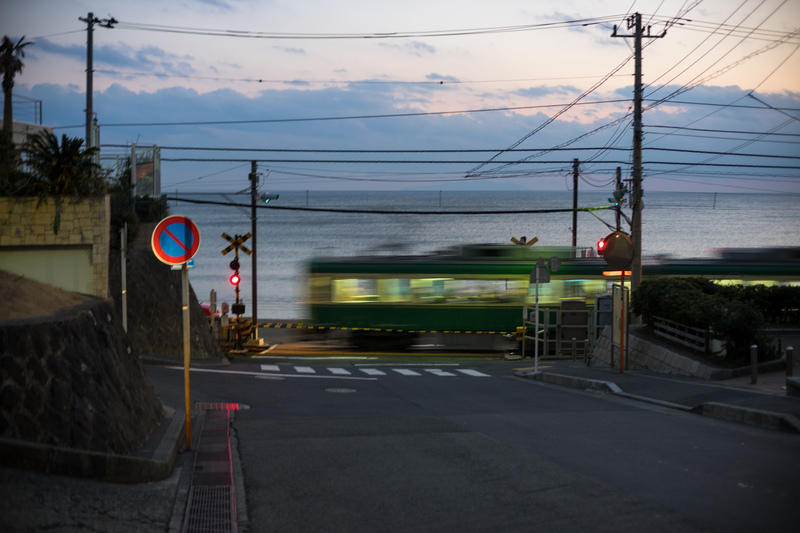 The access from to get to Enoshima, is by train. 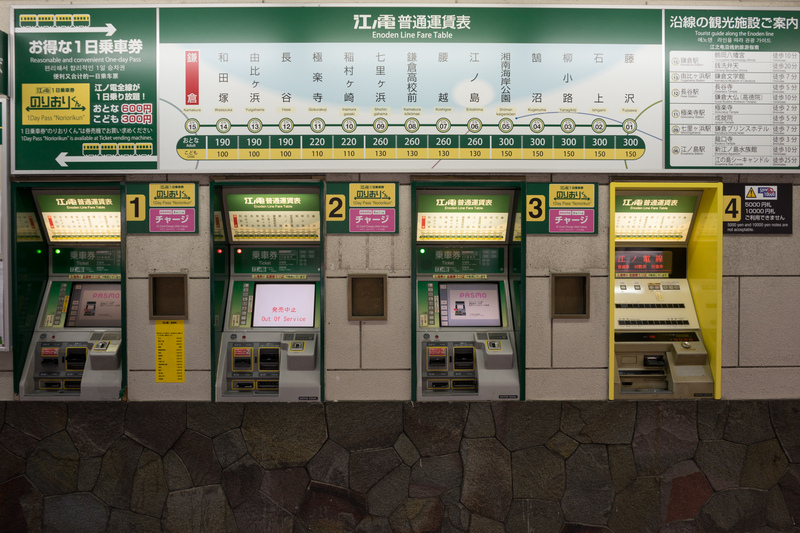 An easy and inexpensive way is the Odakyu Free Bus. 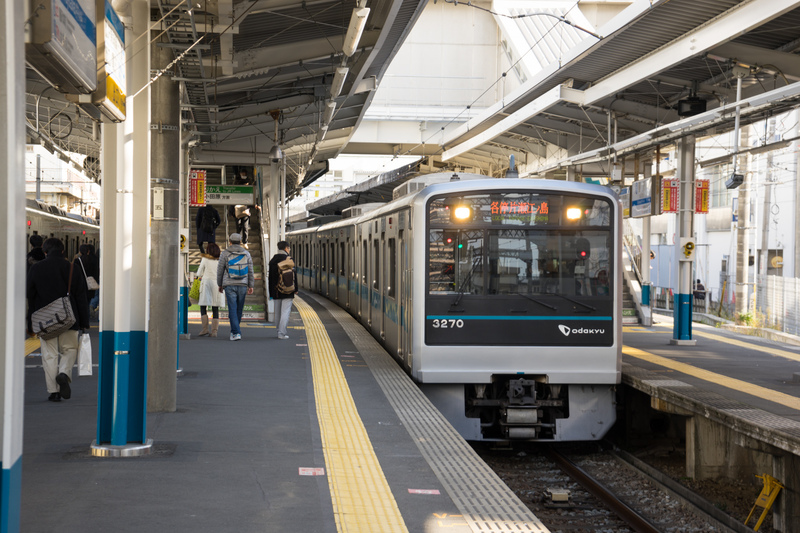 It costs 1500JPY and include a return ticket from Shinjuku, Tokyo to Fujisawa, Nakagawa. 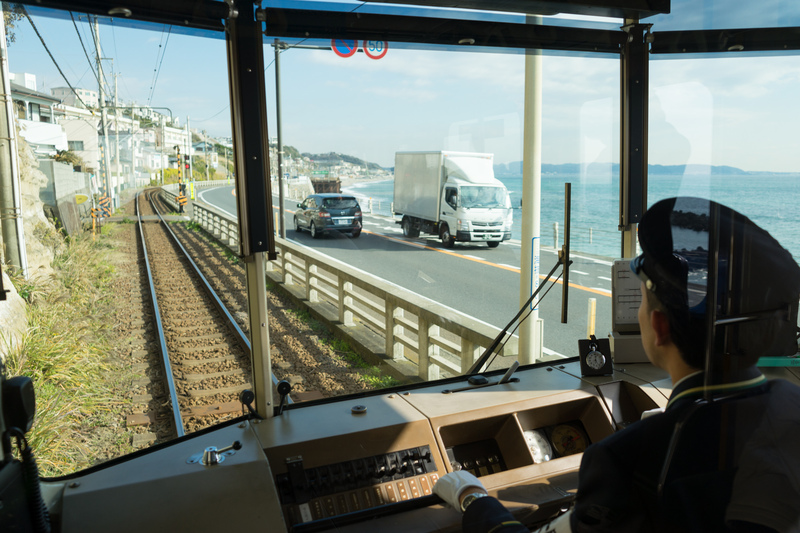 Also a unlimited-ride ticket for Enoden, a local small train running beside the seaside. 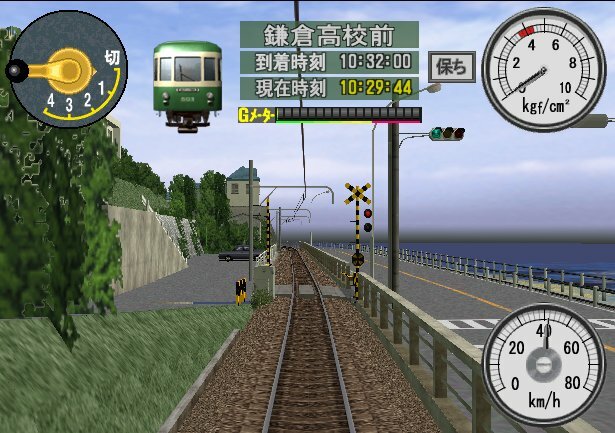 I falled in love with this Enoden from about 10 years ago, thanks to a game called Densya de GO, means riding a train. 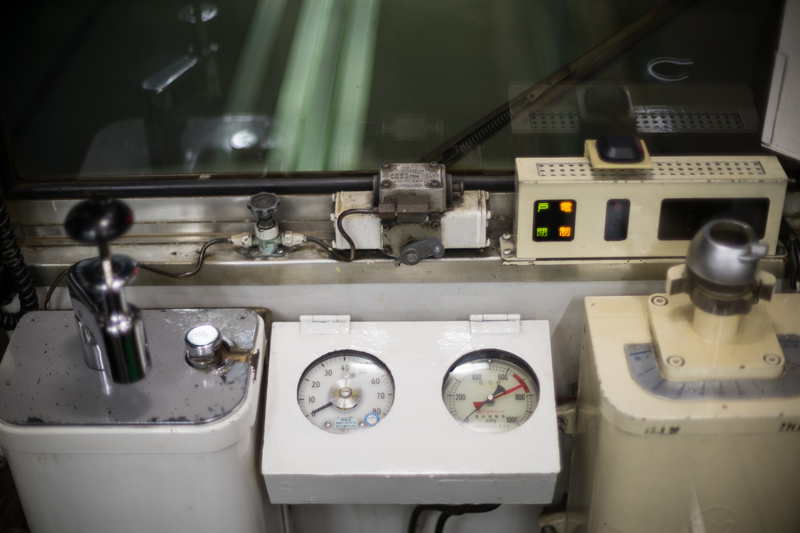 At the Game, I can simulate the driving of train in real environment, and I could remember every little thing during the driving. I really has been moved by the view just around me, it is the first time I took the train but I was so familiar. 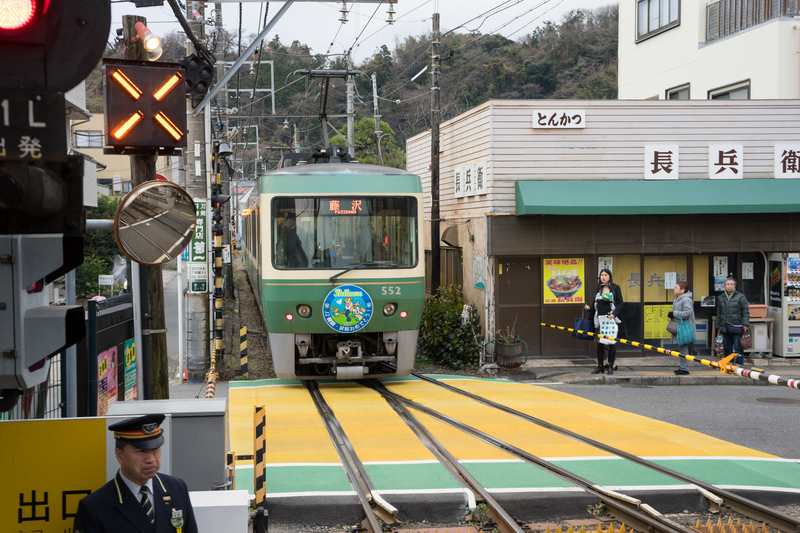 At the end of the Enoden rail, there is a Frog, for the word Frog in japanese is the same sound of Coming back, it means safety coming back everyday. 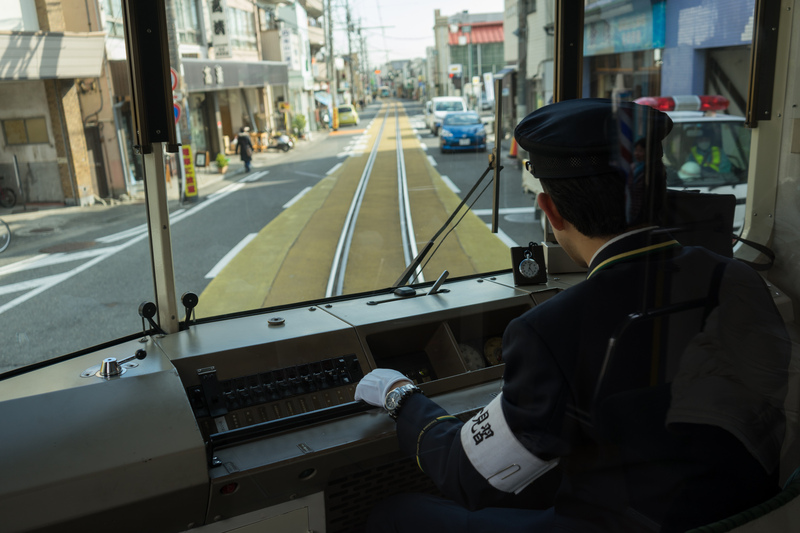 By a section of the rail is seated on the road, just like Toden Arakawasen, however I didn’t see any car running on the train rail area. 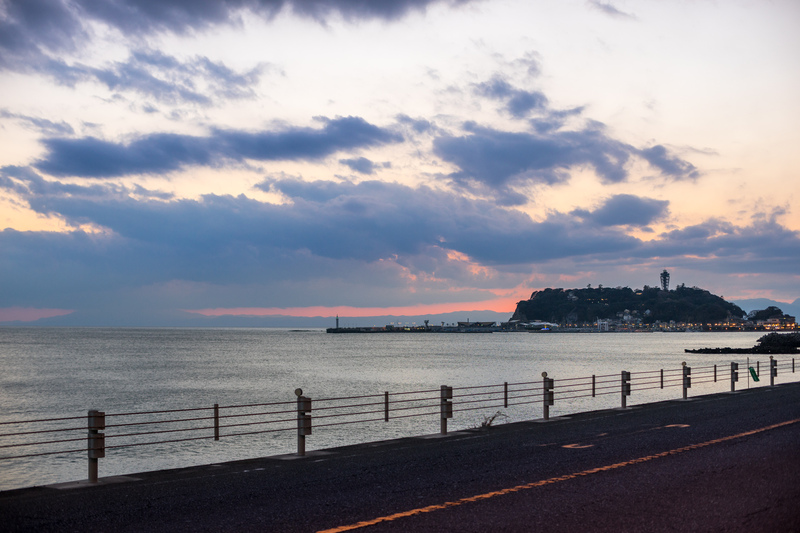 The middle area of the whole route is just running beside the sea, nothing except happiness could be feeling at that moment. 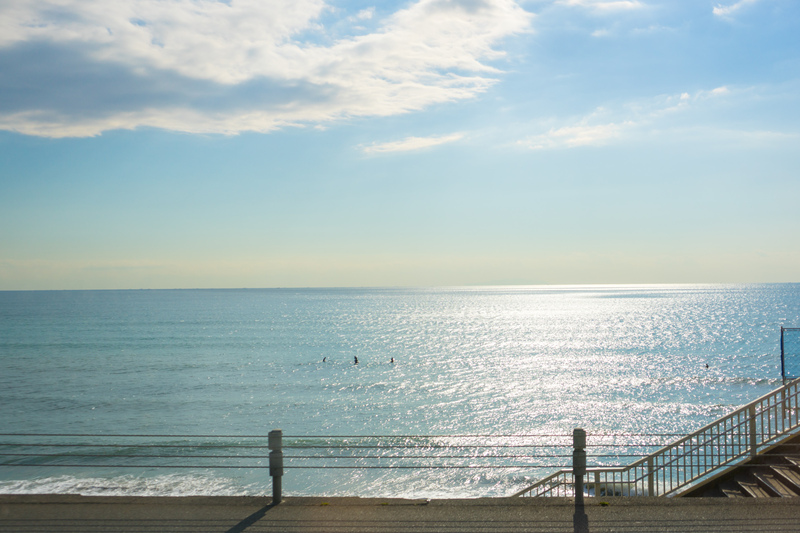 Although it was winter time, many people were surfing on the sea. 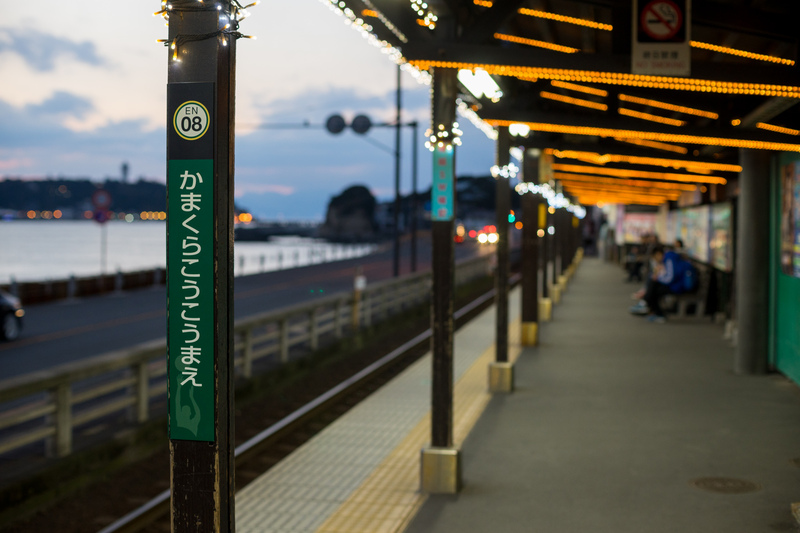 At another end station, Kamakura, there is also a Frog. 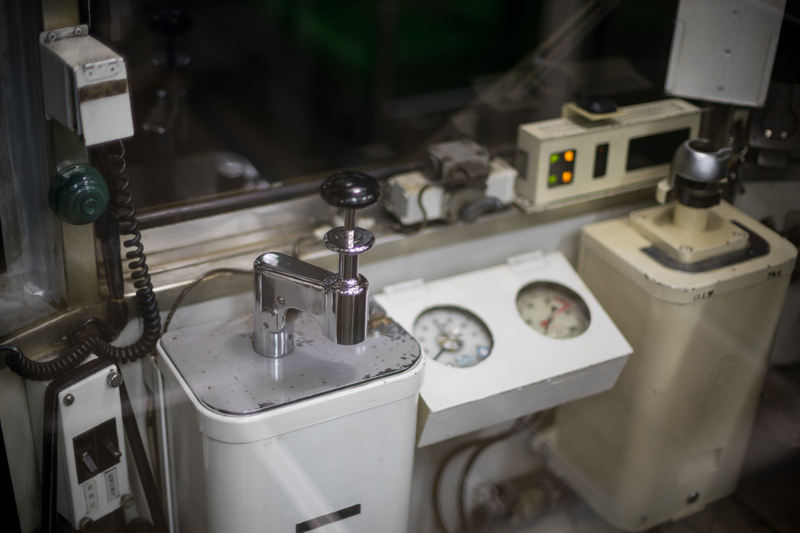 Several kinds of trains are used in this line, a lot of special painting train, so I could not know them, except I gamed types. 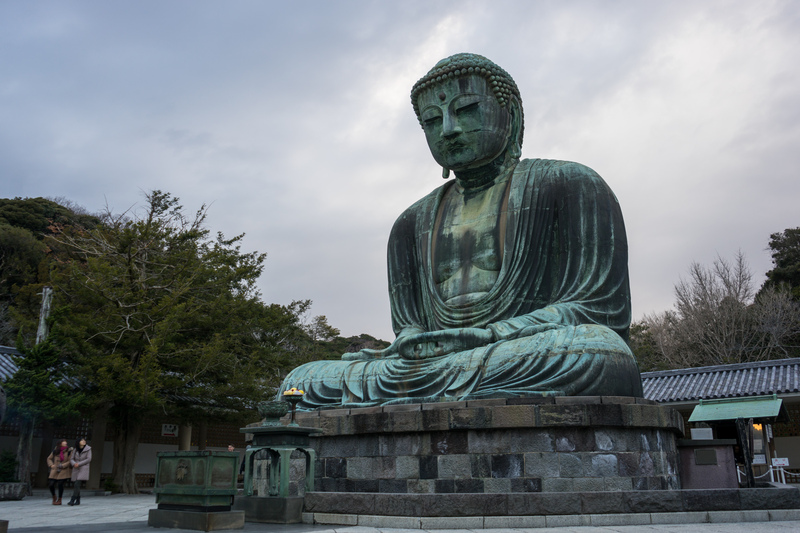 Since I did not spend much time in City Kamakura, a historical city, an old capital city of Japan, a city with many Temples. I felt just touring site with modern remade buildings. My interest point is just not here, sorry for that. 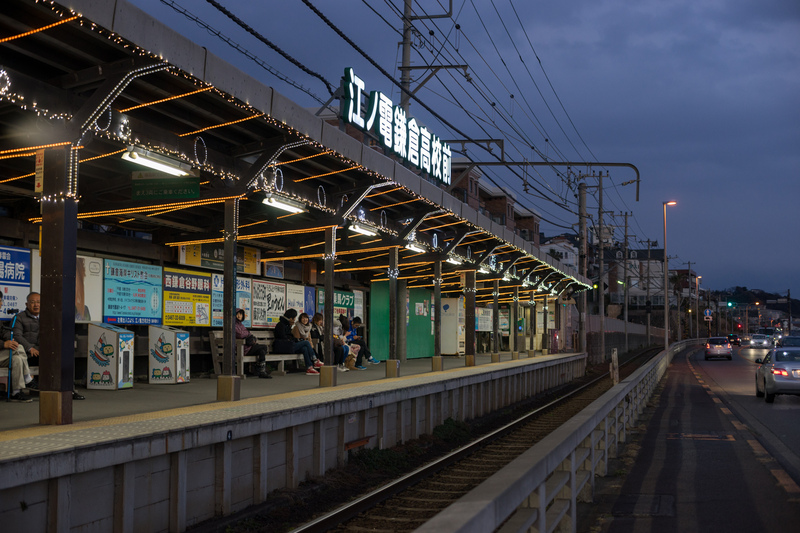 JR kawamara Station. Black and white style. 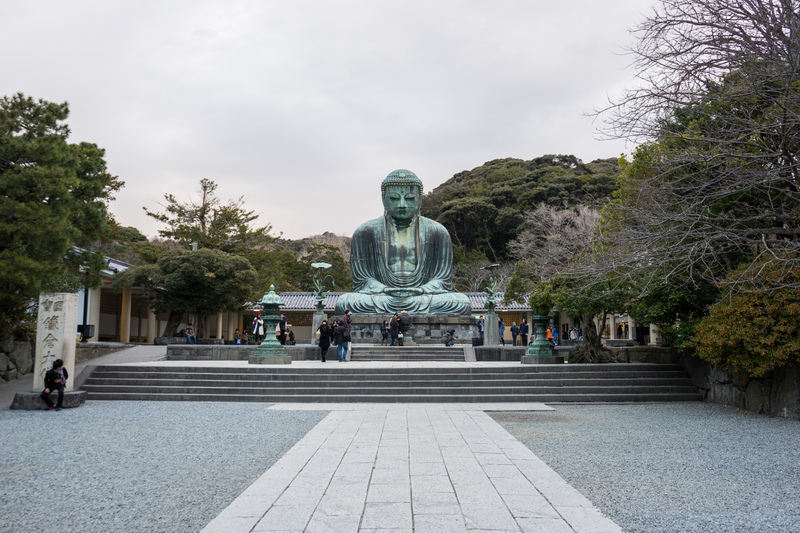 The one temple I went in Kamakura is the Tsuruoka Hachimangu, top 3 Hachimangu in japan, for more information, please Wikipedia here. 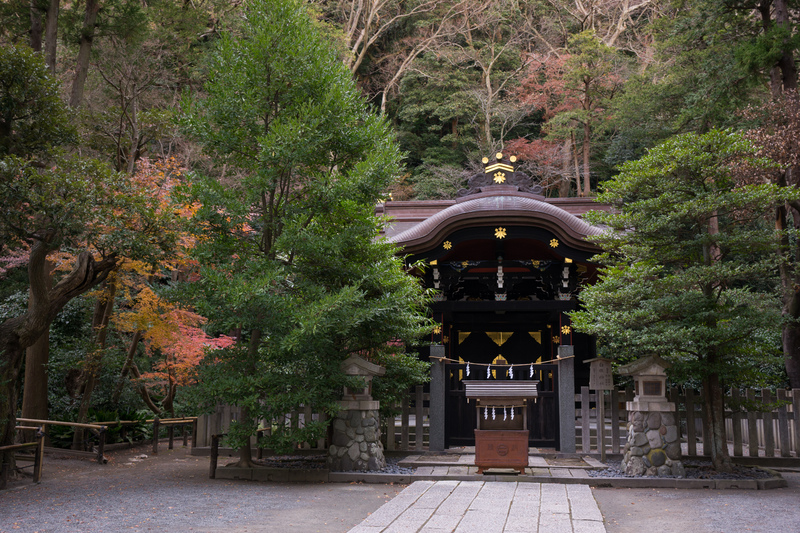 A homework before go to these kind of historical spots is very necessary, but I did not do any. So, quite boring. 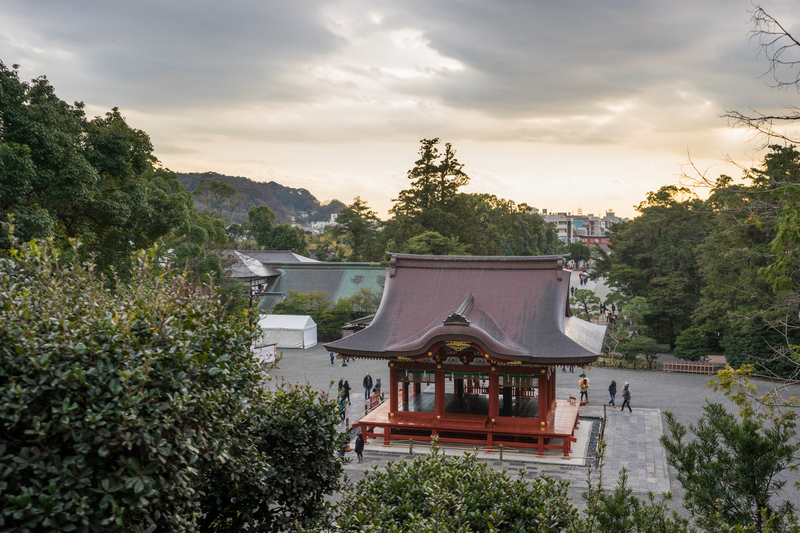 Temple Tsuruoka Hachimangu is located on a small mountain, so for the top can almost saw the seaside and the city Kamakura. 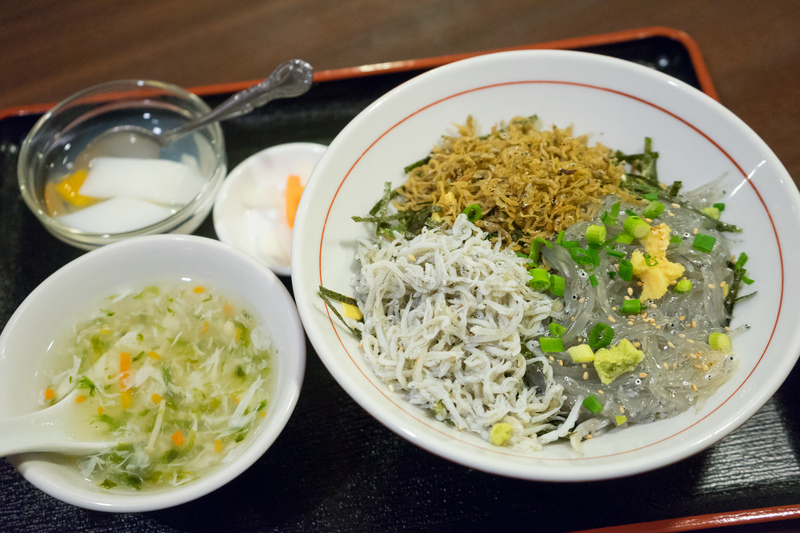 The most famous food in City Kamakura, Shirasu Don, a kind of small fish on rise. Delicious! 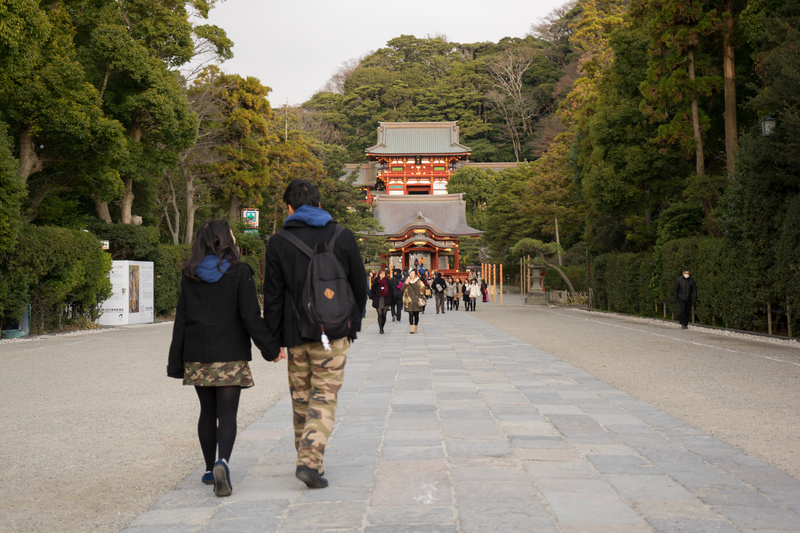 but not cheap, 1000JPY. 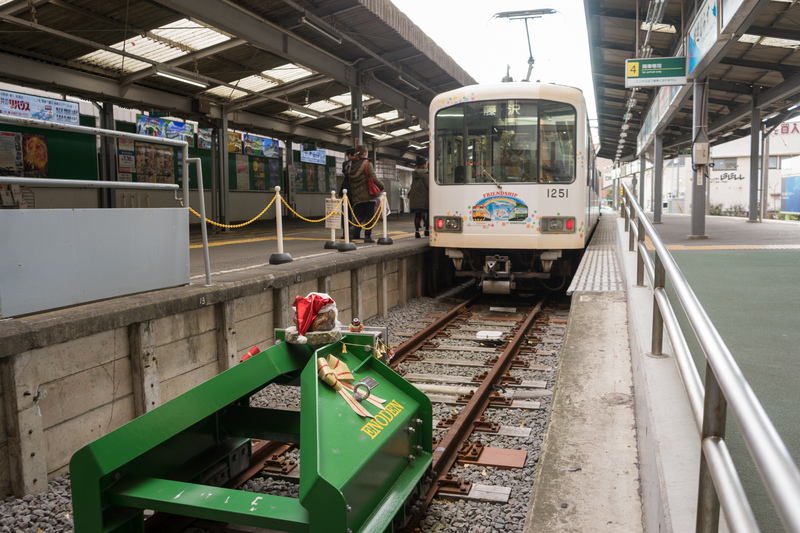 Finished the visit in City Kamakura, again, I took the Enoden Train back to Enoshima. This time’s Enoden has a big font window, must be a nice view for taking photo! Halfway went back, I visited the Big Buddha,12 meters high. 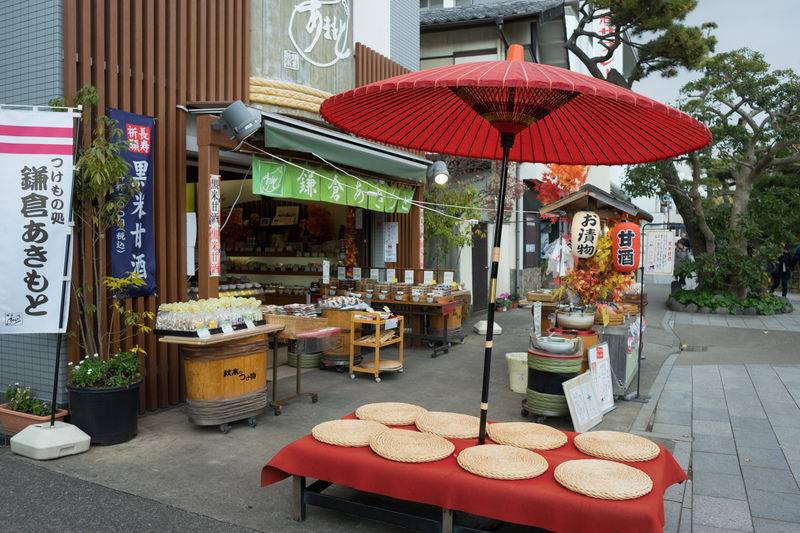 A famous spot for tourist and cost 200JPY. The sunning day turned into little rainy by that time, so thanks to that, there are barely people around. A corner at the entrance of the Big buddha Temple. 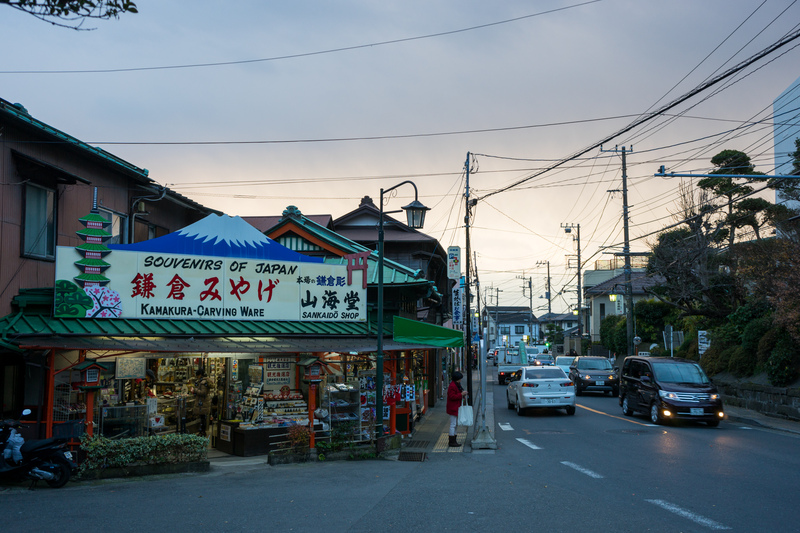 Quite japanese style, and time to sunset. 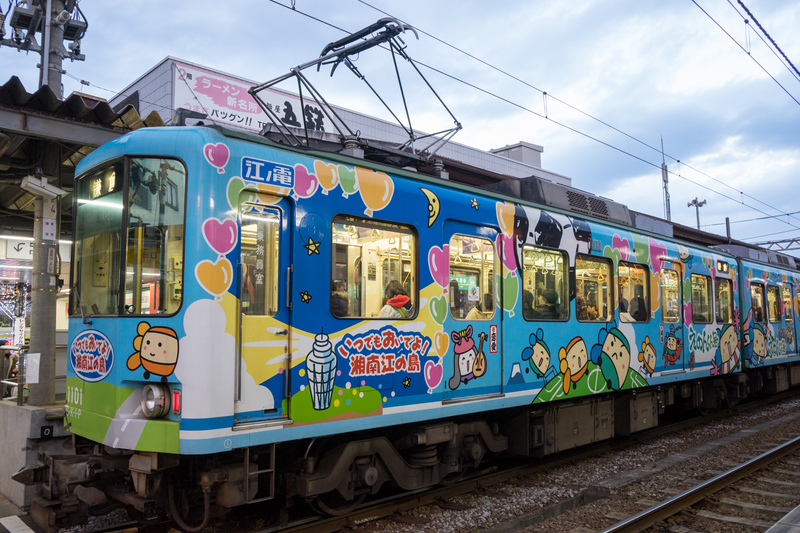 Cute Endo train, but not my direction. 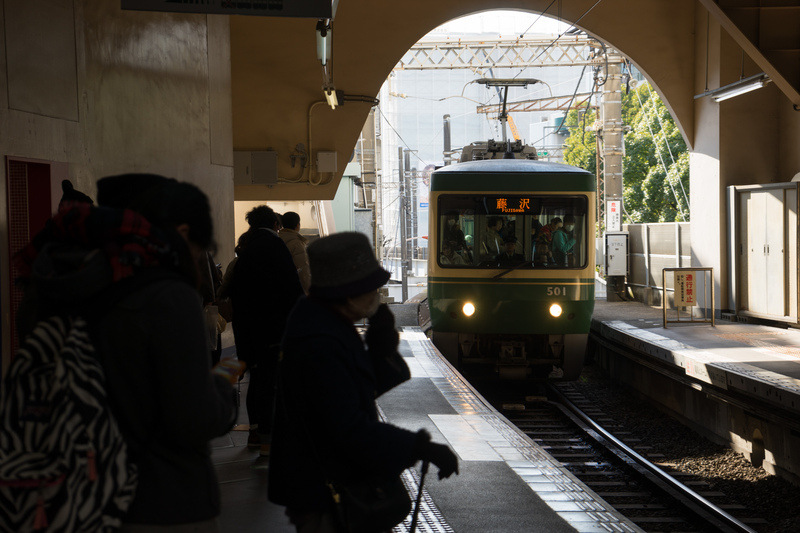 From this moment, I started to use the 50mm f1.2 fast lens, and arrived at Kamakura Kokomae Station, the most beautiful station in all the Enoden line in my opinion. Just a road across, and there will be the beachside. 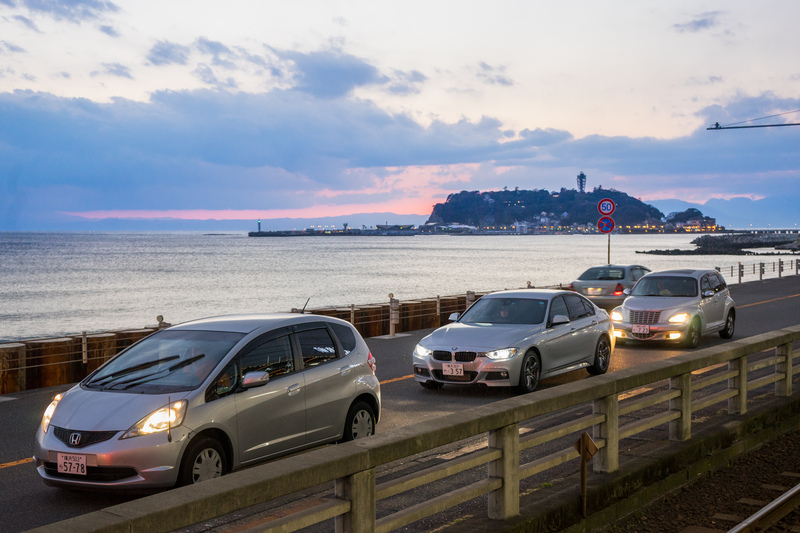 The island behind the scene is the Enoshima Island. 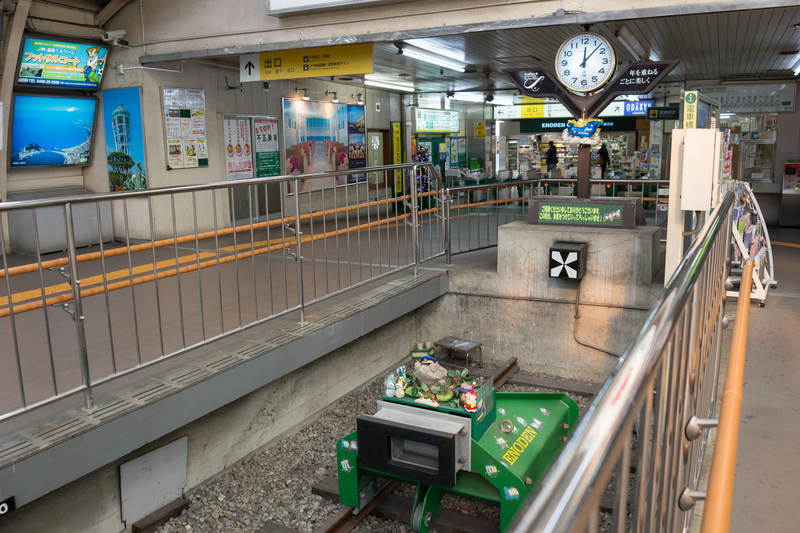 Went out of the station and watch back, I was finding a famous spot for animation childhood memory. 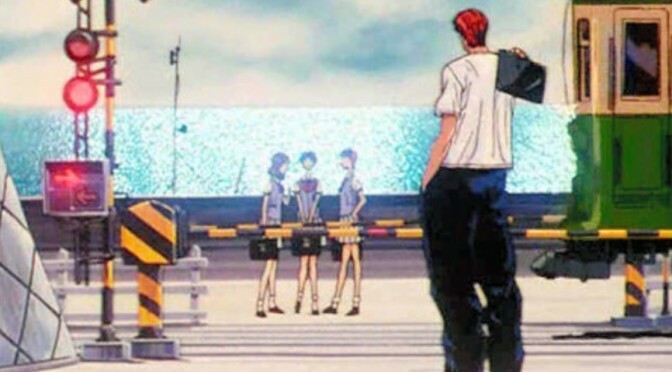 This crossroad of the train and road is the famous scene of japanese Animation Slam Dunk. For your information, I post the pic in the Animation. I watched this Animation when I was at primary school, totally fantastic memory! 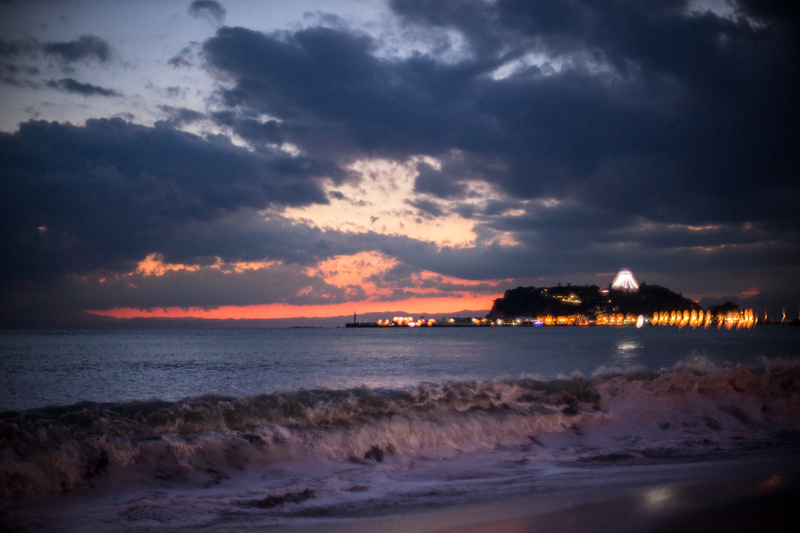 Because of the construction beside the seaside, not big area I could go around, shot some pics on the soft sand beach. 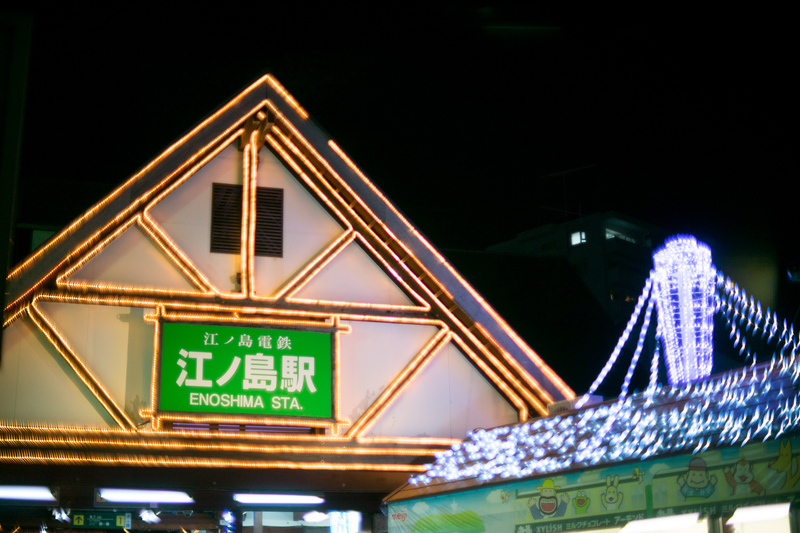 Enoshima station, nice illumination. 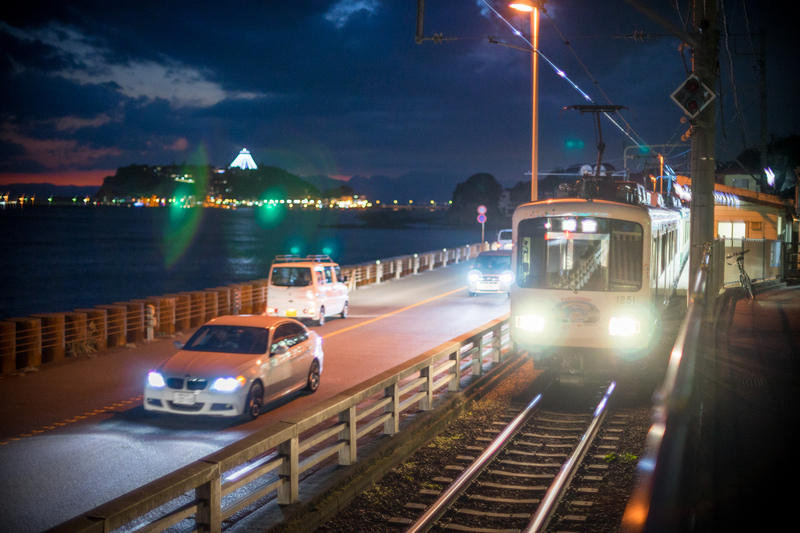 A transfer to Shonan Monorail can be done here. 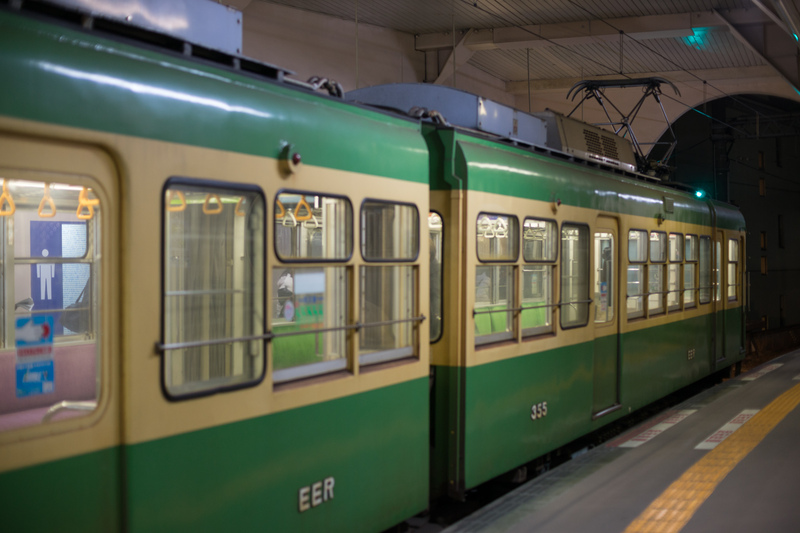 Finally I got a chance to take a 300 type, the oldest train of the Enoden Line and I played in Game. 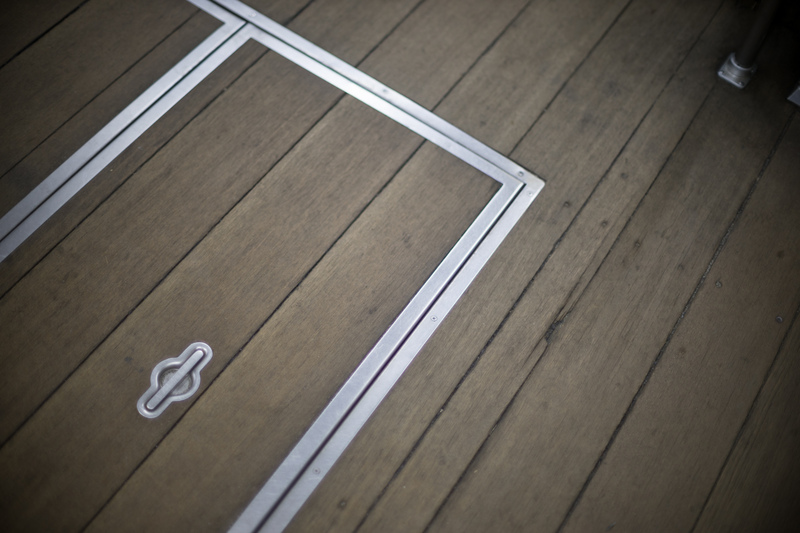 Aged control bar, hydronic brake pedal, even the floor is made by wood. This is the Train what I want to ride. 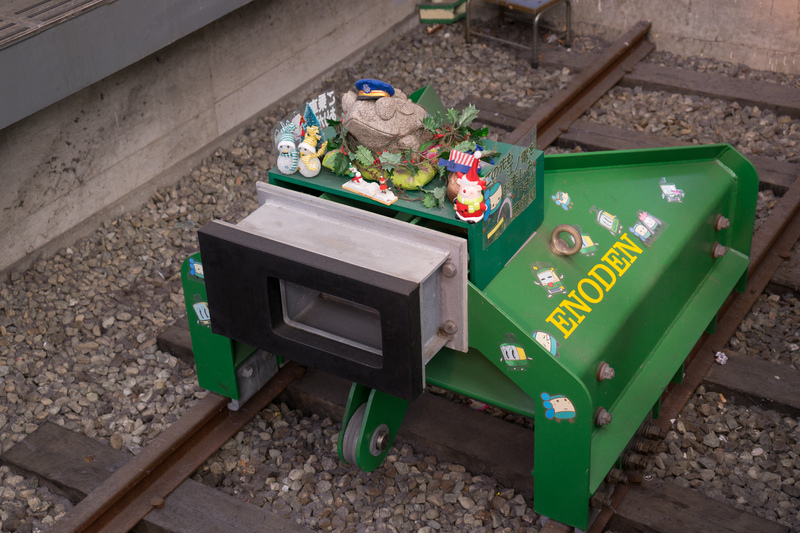 For further info, check Wikipedia for Enoden here. It is a special one day trip for me, I must playing Ingress during the trip for more progress, at the same time I took photos with A7, so pretty busy and messed up. 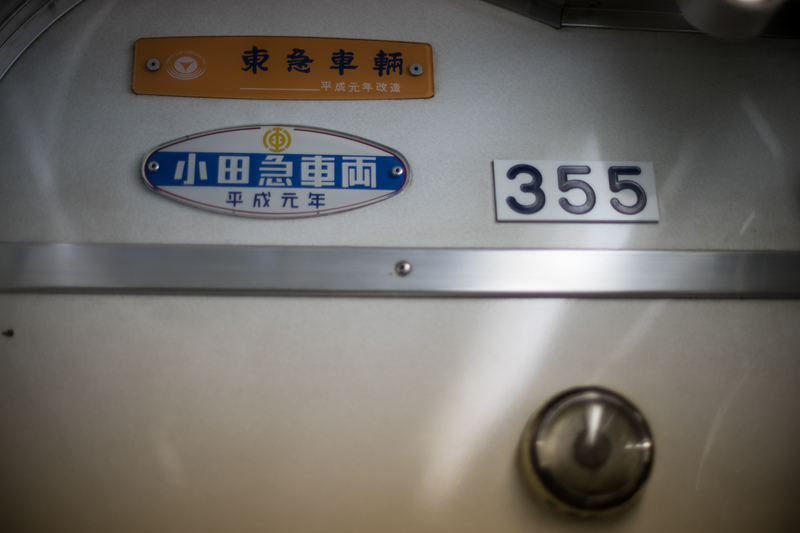 Also, my interest point is almost on the Train Enoden, so maybe not a typical travel post, sorry for that. 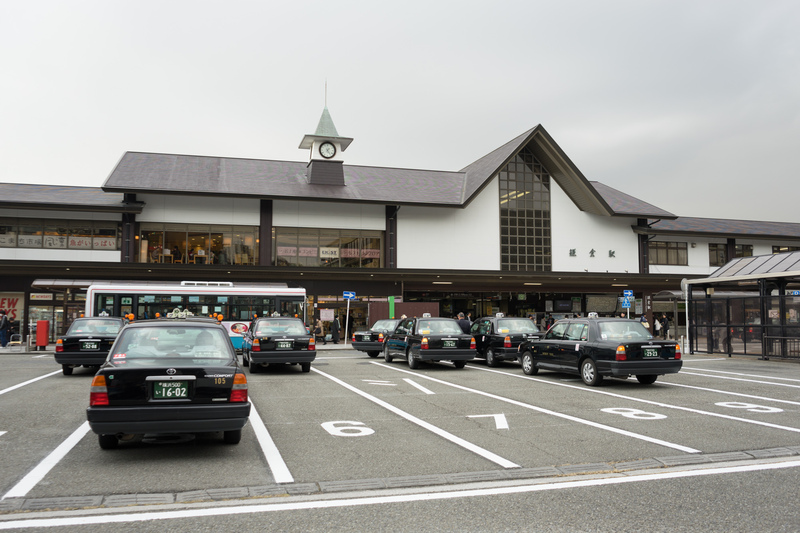 However, it is easy and inexpensive from Tokyo to get there, I think I will go again, soon.